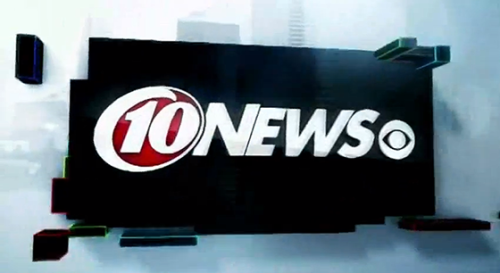 Gannett has started to roll out a new graphics package across its properties, including WTSP-TV in Tampa, Fla., shown here. The new 16:9 graphics package uses a darker, more elegant feel that used 3D blocks as its main design element. During animations, the virtual camera weaves its way between blocks as bursts of light sweep through as well. The package uses a steel-blue color scheme and dark reflective surfaces as well. Perhaps the biggest change is the new lower thirds. Lacking any graphic embellishments, the graphics continue the square shaped motif and also includes an integrated ticker and time and temp bug. The new opens are impressive, if not slightly reminiscent of NBC’s election graphics the the original “Rock Center” package. The lower thirds could benefit from at least some subtle graphical treatment that connects them to the animated portions of the graphics package. It’s also a bit confusing what the three blocks just below the lower third are meant to be — either the rundown or a topical label for the ticker beneath. Thanks to Jason Bowman for the tip via Twitter.